Almost 500,000 drones fly in Germany: There are about half a million drones in circulation in Germany. Of these, 455,000 drones are used privately and 19,000 drones commercially. The professional users rarely use the drones for a single purpose, but use them for various applications: surveying, mapping, inspection, filming and photography, etc. 400 drone companies and 10,000 people are involved with drones: There are almost 400 drone companies in Germany. On average, these are three years old and have 12 employees. 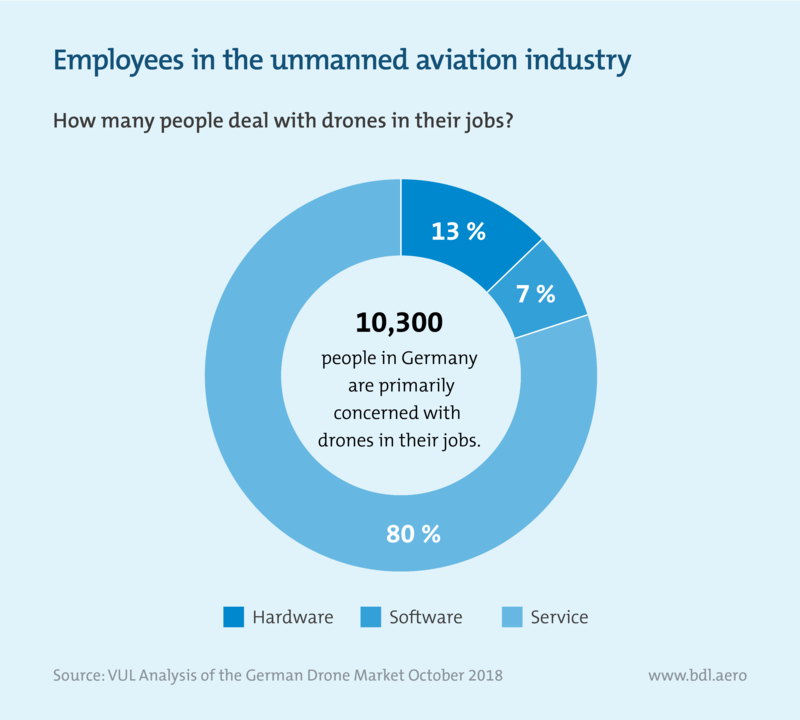 Around 10,000 women and men in Germany are primarily concerned with drones in their jobs. Since 2012, 170 million US dollars have been invested in German companies specializing in drones and air taxis. Germany’s drone market is in the midfield internationally:The German drone market is currently worth 574 million euros. The commercial drone market accounts for 404 million euros and theprivate drone market for 169 million euros. In the ranking of the largest commercial drone markets, Germany ranks fourth, after the USA, China and France. This is put into perspective, however, if one does not take the absolute value of the market as a basis, but the size of the market per employee –then, Germany ranks 17th. 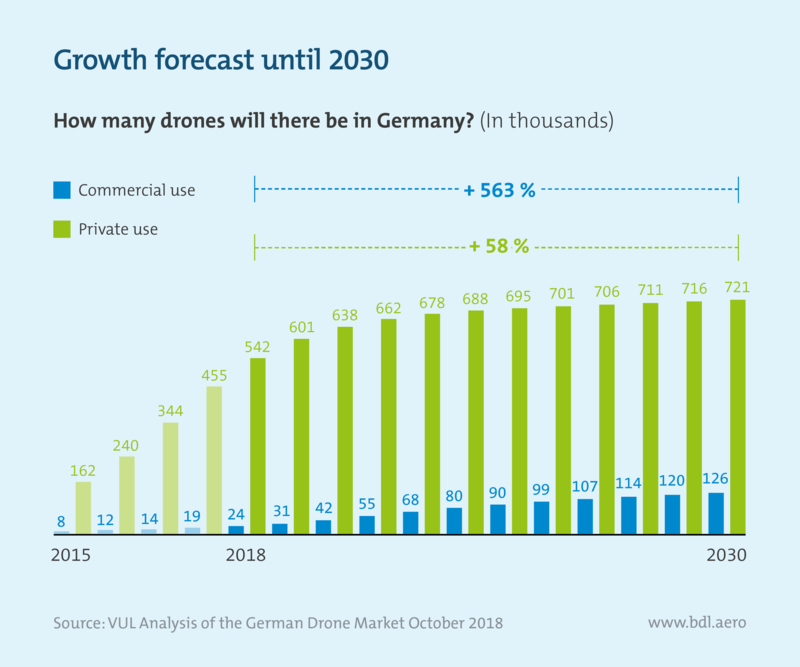 The German drone market will continue to grow: The number of operational drones in Germany will increase to around 850,000 by 2030. While growth in private use is leveling off, the number of commercial drones is increasing to 126,000. At present, only one in every 24 drones in Germany is operated commercially; by 2030 it will be one in every six. 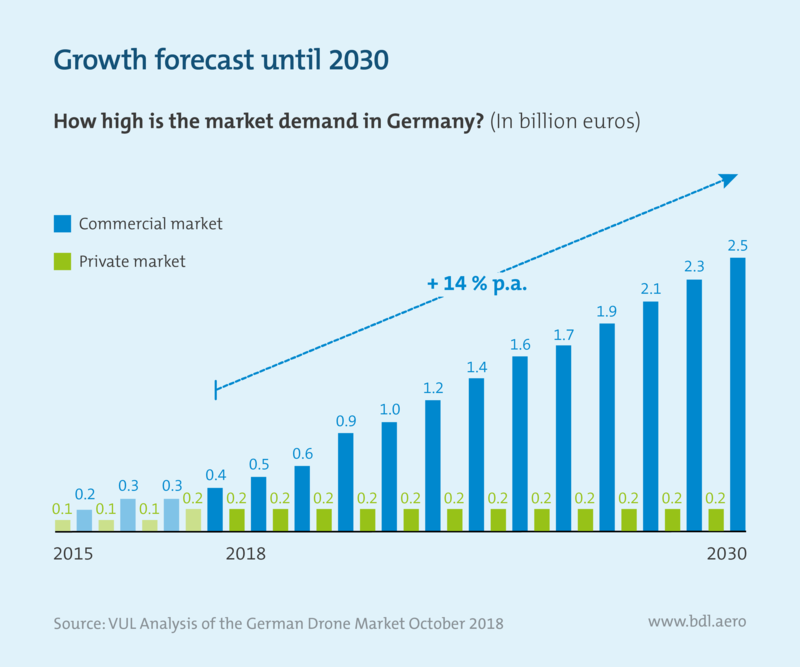 The German drone market will grow from 574 million euros to almost 3 billion euros by 2030,which corresponds to an annual average growth rate of 14 percent. Growth will be driven primarily by the commercial market. There are about half a million drones in use in Germany. The number of privately used drones exceeds the number of commercially used drones by a factor of 24. About 455,000 drones are privately owned. Toy drones worth up to 300 euros account for almost a third of this figure. The other two thirds of privately used drones are so-called prosumer drones, which are equipped with small cameras and are used by their owners for vacation pictures, among other things. The number of commercially used drones is significantly lower at 19,000. These are mostly prosumer drones equipped with cameras, worth up to 10,000 euros. Less than 5 percent of commercially used drones are larger professional drones worth more than 10,000 euros. Professional users often use their drones for multiple commercial purposes: a drone that supplies images for film and television productions is also used for aerial photography as part of the project management of a construction site. Surveying is at the forefront of applications, as the market for surveying is characterized by extremely low margins. Drones help to save time and increase productivity and quality. Inspection and mapping tasks are also personnel intensive, time consuming and sometimes dangerous without the use of drones. Drones are increasingly used to inspect buildings and infrastructure such as wind turbines and high-voltage power lines. The maturity levels of the individual applications vary greatly. How the use will evolve depends on technical developments, legislation (e.g., enabling flights out of visual range), infrastructure and, last but not least, public acceptance. In Germany there are a large number of companies that deal with unmanned aviation in one way or another. For many companies, this is not the focus of their entrepreneurial activities, but one of many business areas. In Germany, however, there are also almost 400 companies that focus on drone technology and unmanned aviation. These companies, which focus on unmanned aviation as their core business, are characterized by a strong start-up culture due to the relatively new technology. This is reflected in the proportionallysmall workforce of an average of just over 12 employees and in the low age of the companies of around three years. In many cases, the turnover generated by companies is still low. The average annual turnover of companies specializing in drones is just 330,000 euros. However, sales have increased significantly in the past year or two. 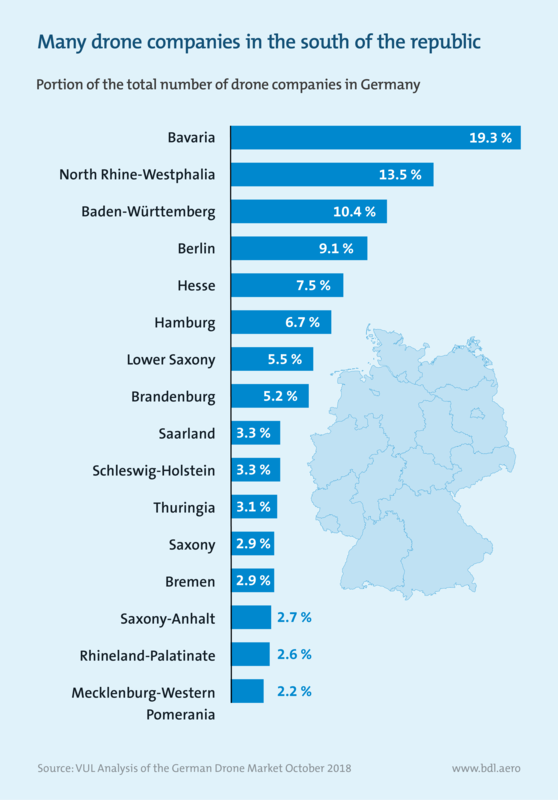 The almost 400 companies that deal with unmanned aviation or air taxis in their core business are unequally distributed in Germany: Many drone companies are based in the south and west. Every fifth company comes from Bavaria. There are also a good number of companies in this sector in the large states of North Rhine-Westphalia, Baden-Württemberg and Hesse. The southern part of the country is home to the two companies that are leaders in Germany in the development of air taxi technology: Lilium in Weßling(Bavaria) and Volocopterin Bruchsal(Baden-Württemberg). 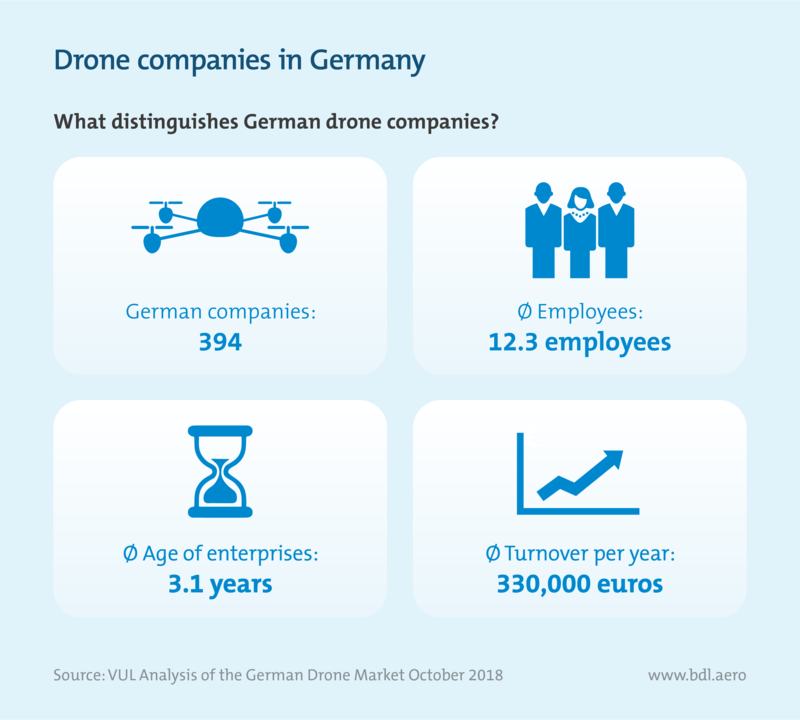 There are also an above-average number of drone companies in Berlin, which is characterized by a strong start-up culture and therefore fits in well with the young technology, and in Hamburg, one of the world’s largest locations for the aerospace industry. Since 2012, 170 million US dollars have been invested in German companies specializing in drones and air taxis. This amount represents approximately 6 percent of global drone market investment in the same time frame. Only around 55 percent of the investment in German companies come from German investors, with the rest coming from abroad. At a global level, most investmentscomes from US backers. 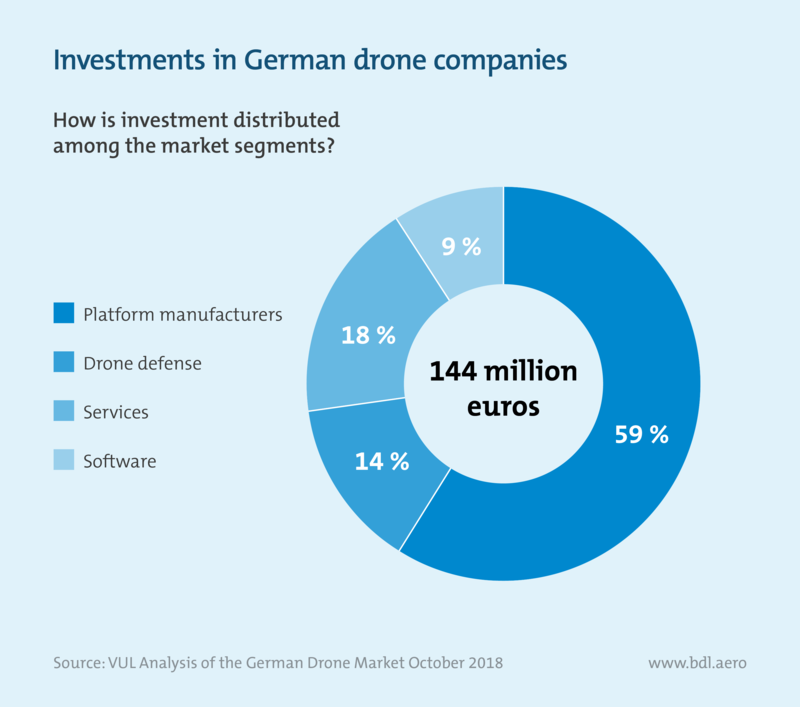 At around 60 percent, the largest proportion of investment in German companies is made in the market segment of platform manufacturers, i.e., companies that manufacture drones or air taxis. The rest is distributed among the areas of drone defense, services and software. The investments focus on the urban air mobility segment, putting Germany in second place internationally for investment in this area. The two air taxi start-ups Lilium and Volocopterwere able to obtain larger investments. 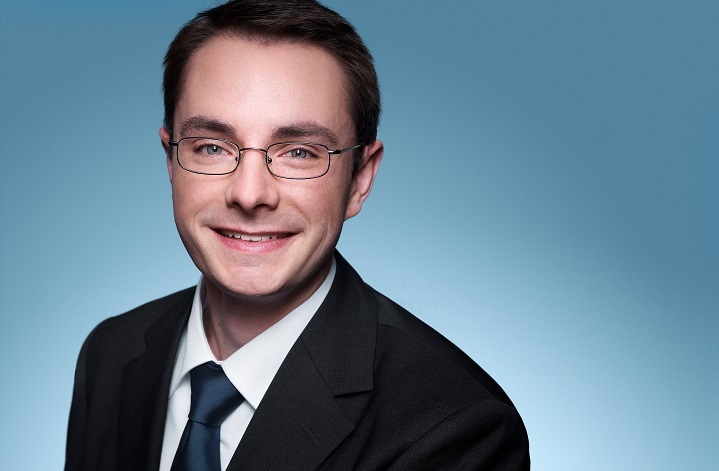 A third company in this market segment, Dedrone, has now moved its headquarters to the Silicon Valley in the United States. Outside the market segment of urban air mobility, investment in German drone companies is rather low. 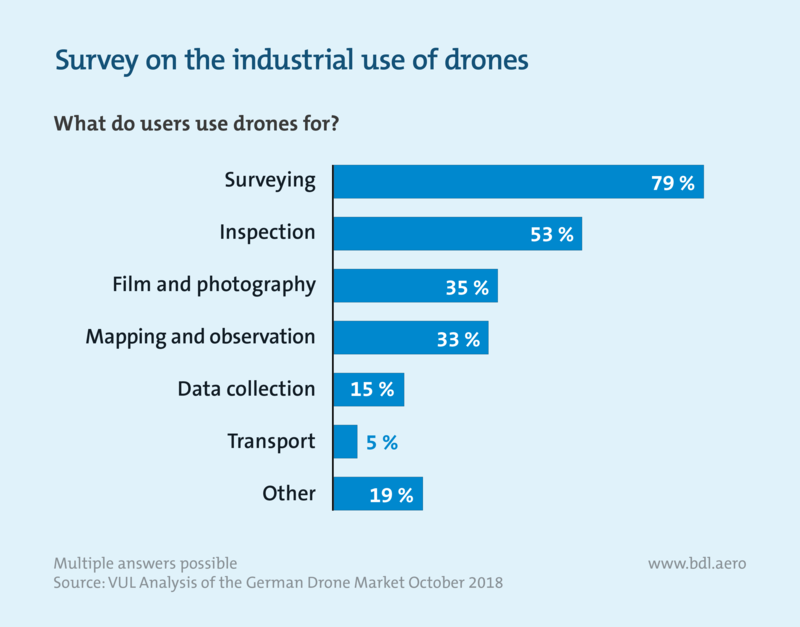 Around 10,300peoplein Germany are primarily concerned with drones in their jobs. At 80 percent of the workforce, the overwhelming majority is active in the service market segment. This mainly includes people who use hardware and software commercially to provide services for other companies, but also people working in areas such as research and development, maintenance and repair and consulting. This segment also includes employees of companies that do not deal with drones in their core business but in which individual employees are in charge of drone-related tasks. About 13 percent of employees in the drone industry work in the hardware market segment. This includes the manufacturingof drones and air taxis, the manufacturing of individual components and accessories and work on systems associated with unmanned aerial vehicles: ground control systems, navigation systems, drone defense systems, etc. In an international comparison, the share in the hardware segment is rather high. The remaining 7 percent of employees work in the software market segment, i.e., they develop and implement software solutions for flight control, flight planning, data evaluation, training, etc. The drone industry is characterized by strong international trade: many products are exported and used in countries other than their countries of manufacture. Drones from German manufacturers are in high demand abroad. This is shown by the high export quota of 80 percent for professional drones, i.e., larger drones with a value of 10,000 euros or more. 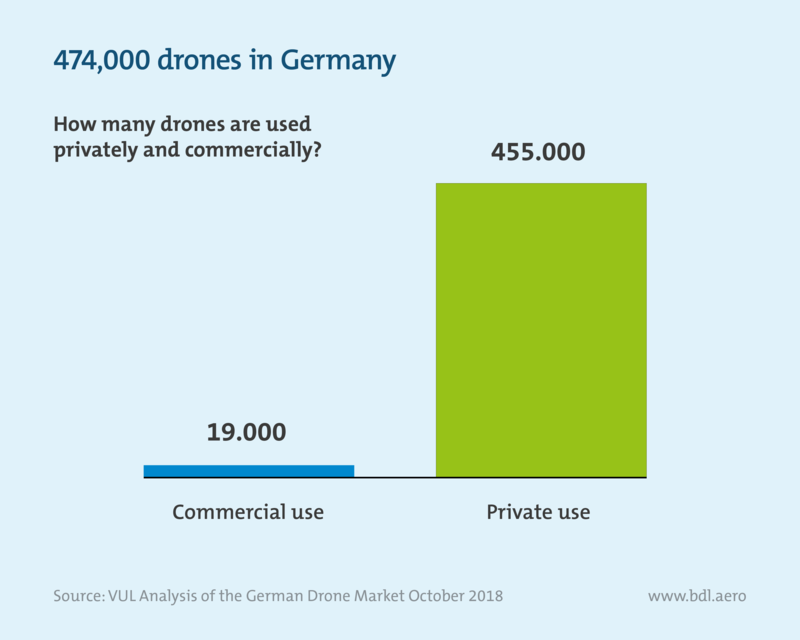 However, around 60 percent of the professional drones in commercial use in Germany also come from abroad and were imported. The majority of the high-quality drones on the German market were therefore produced by foreign manufacturers. 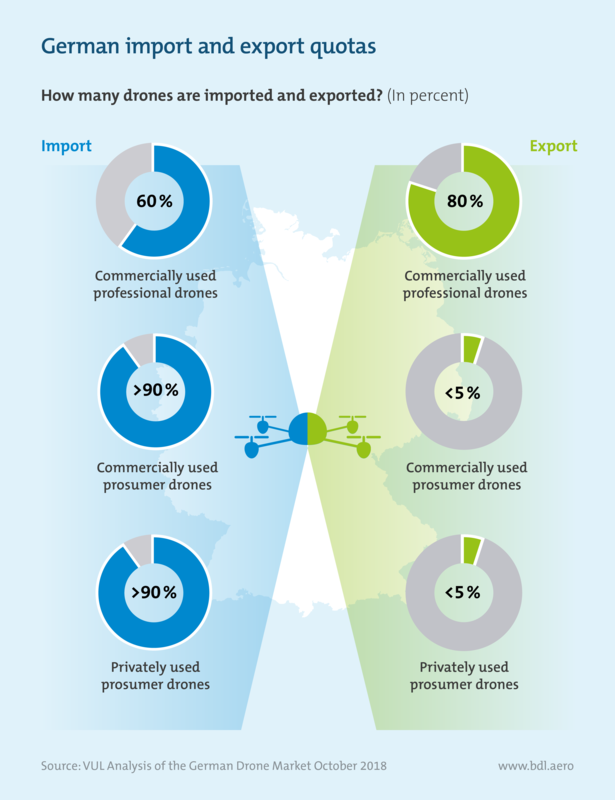 Prosumer drones for commercial and private use, i.e., drones equipped with cameras, are almost exclusively imported. The high import and low export quotas show the lack of manufacturers of prosumer dronesin Germany, but are also attributable to the market power of a few large suppliers who dominate the global prosumer market. 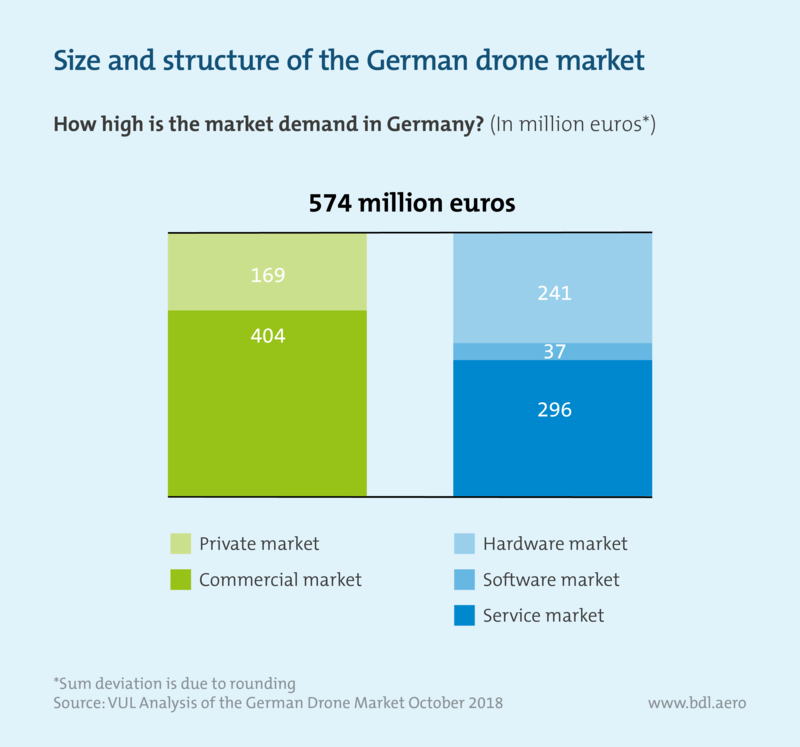 The German drone market is estimated at a total of 574 million euros. The commercial drone market accounts for 404 million euros and the private drone market for 169 million euros. The hardware market accounts for 241 million euros of market demand. This segment includes, for example, private and commercial drones as well as additional components and systems. Currently, the commercial share is 31 percent and the private share 69 percent. The software market is comparatively small at 37 million euros. This includes, for example, software for flight planning, flight operation and data processing. The software market is 95 percent commercial and only 5 percent private. At 296 million euros, the service market is the largest segment.This includes, for example, all services provided with drones by all companies in all industrial sectors. The service market is 100 percent attributable to the commercial drone market. Based on data for 21 European countries, a ranking of the largest commercial drone markets in Europe was compiled. With 20 percent of the world market, the entire European market is the second-largest drone market after North America. According to absolute figures, Germany is the second-largest commercial drone market in Europe after France, with 404 million euros. France, Germany and Great Britain together account for almost 60 percent of the European drone market. Switzerland, the Netherlands, Norway and Italy follow, a little way behind. 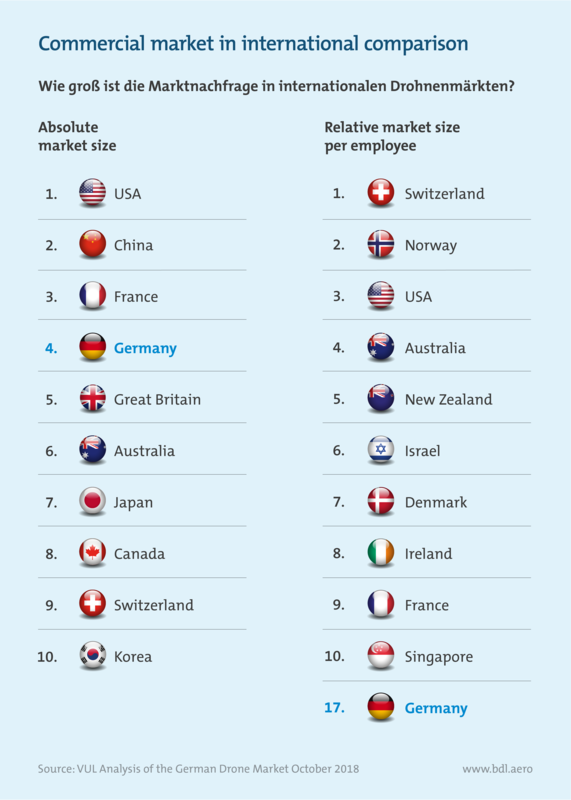 If the ranking is not based on the absolute size of the market but on the size of the market per employee, Germany’s strong position is put into perspective. In this case, Switzerland and Norway are ahead, Germany tenth. Switzerland is characterized by large software and hardware companies that have a positive impact on the use of commercial drones. In Norway, beneficial legislation provides for a large number of drone operators, which drives the demand for drone technology. Based on data for 63 European countries, a ranking of the largest commercial drone markets worldwide was compiled. The USA and China are the largest drone markets. Together, these two countries alone account for around two-thirds of the worldwide commercial drone market. In both countries, the framework conditions for the use of drone technology are more advanced than in many other countries –for example, in terms of enabling drone flights outside the pilot’s visual range and granting rise permits. The three European countries France, Germany and Great Britain follow behind the USA and China with a considerable gap. 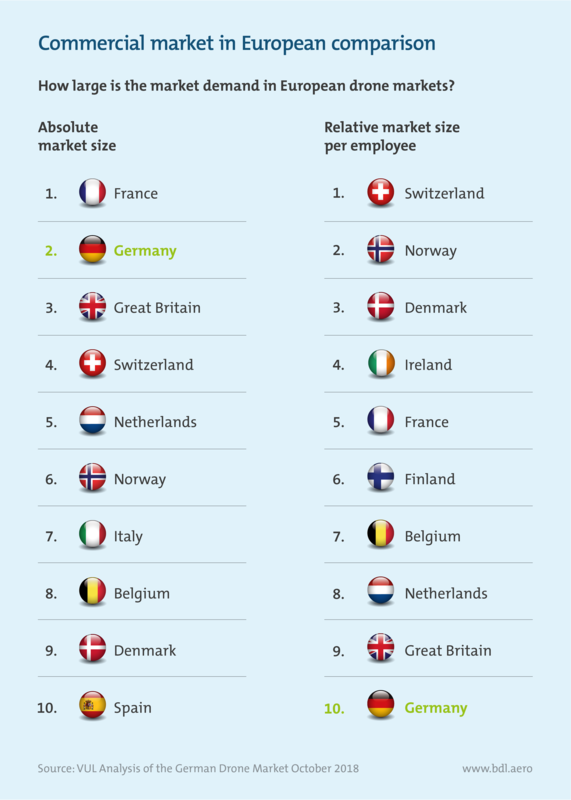 If the ranking is not based on the absolute size of the market but on the size of the market per employee, Switzerland and Norway are also among the leaders in an international comparison. Germany comes in 17th. What were the central statements from the expert interviews? Since 2015, the number of drones in Germany has almost tripled. The number of privately used drones in particular has risen sharply. Based on a market model, Drone Industry Insights predicted further development and also considered drone wear and tear. The figures therefore always refer to how many drones are theoretically ready for use in a given period. Overall, the number of drones in circulation will increase by 79 percent to a total of 847,000 by 2030. In the private-use segment, strong growth is forecast for the next two or three years. However, this will then be significantly reduced, so that from the middle of the next decade onward hardly any growth will be recorded. Overall, the number of privately used droneswill increase by 58 percentto 721,000 between 2018 and 2030. The development in the commercial segment is different: between 2018 and 2030, the number of commercially used droneswill increase by 563 percentto 126,000. While in Germany at present only one in 24 drones is operated commercially, it will be one in six drones in 2030. 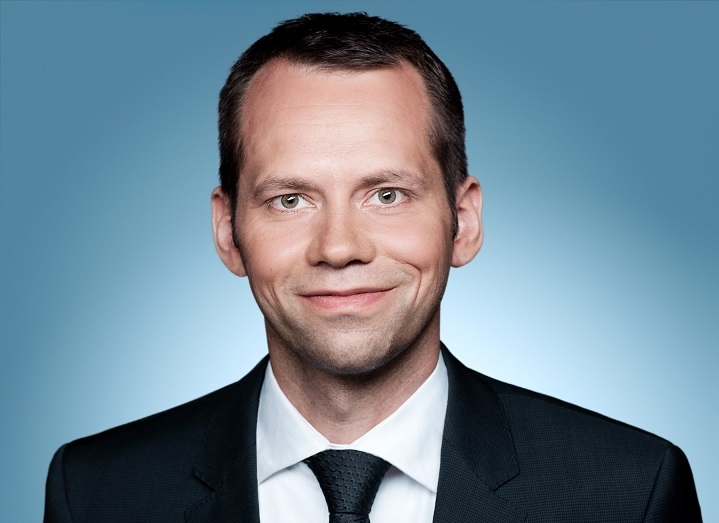 Drone Industry Insights has presented a forecast for the development of the German drone market. The forecast is based on the assumption that in the near future, regulations that are needed to exploit the potential of the technology to a greater extent (drone flights out of visual range, etc.) will be adopted at European and national levels. 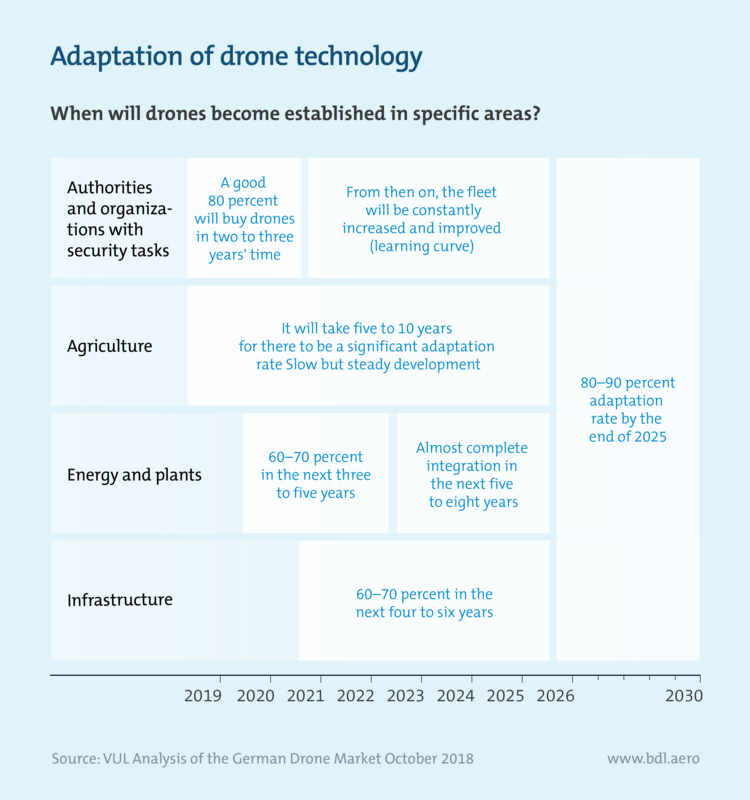 Accordingly, the German drone market will develop very dynamically until 2030. The total market (commercial and private) today amounts to 574 million euros and is expected to grow to almost 3 billion euros by 2030, which corresponds to an annual average growth rate of 14 percent. The commercial market will rise to almost 2.5 billion euros, an average of 16 percent per year. The commercial hardware market is expected to grow by an average of 19 percent per year, the commercial software market by 22 percent and the commercial service market by 14 percent. In the private market segment, however, there are signs of a slowdown in growth. This segment is 170 million euros in size and will grow to around 220 million euros by 2030, i.e., growing around 2 percent per year. In Germany, the great period of adaptation of drone technology is still to come. As of 2026, drones will be in widespread use in all major commercial application areas. Until then, however, different adaptation rates and speeds are expected in the individual sectors. This is mainly due to regulatory issues and the required infrastructure. In the area of security authorities and organizations, the adaptation will take place quickly, since this area has fewer problems with the legal framework conditions due to special permits. In agriculture, the necessary infrastructure for the use of drones is the limiting factor that is leading to the slow deployment of drone technology. In the energy and infrastructure sector, the appropriate use of drones often requires long flight distances (e.g., for the inspection of railway tracks), but regulatory barriers currently stand in the way, such as the lack of a legal basis for flying drones out of visual range. This leads to a delayed adaptation of the technology in these areas.